Who is regulated in the US forex industry? Why does any of this matter for my forex trading? Commodities Futures Trading Commission (CFTC): The CFTC has the ultimate regulatory authority over the futures markets, which includes the forex markets. 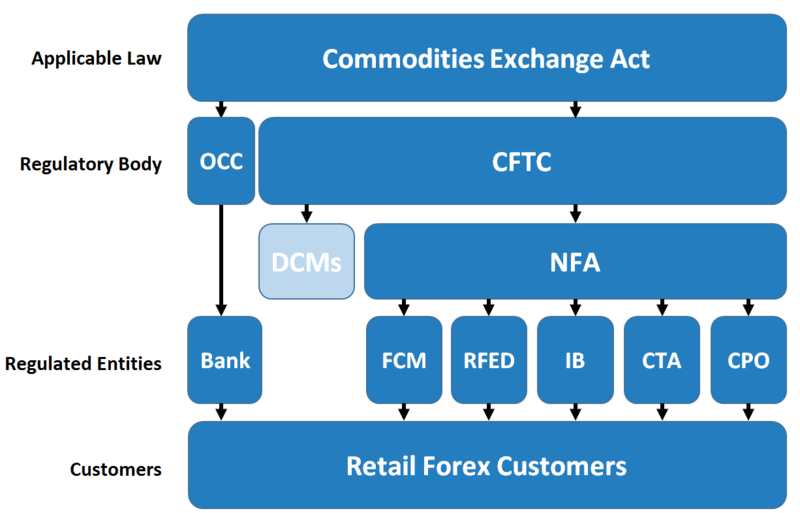 The Commodities Exchange Act provides the legal framework within which the CFTC operates. The CFTC established a set of CFTC regulations to govern the futures and forex trading markets. All non-bank forex brokers dealing with retail clients are covered by the CFTC regulations. National Futures Association (NFA): The NFA is a self-regulated organization for the futures and forex industry and serves as a watchdog for the industry. The NFA has put in place rules of conduct for its members that go beyond the CFTC regulations. The NFA has the power to issue fines and to suspend operations of their members. They also provide dispute resolutions services to arbitrate disputes between investors and NFA members. All non-bank forex brokers dealing with retail clients must be NFA members and be subject to NFA rules. Office of the Comptroller of the Currency (OCC): The OCC is an independent bureau of the U.S. Department of the Treasury. The OCC is responsible for regulating futures and forex trading for national banks and foreign banks. The OCC has put in place regulations to govern banks as required by the Commodities Exchange Act. All banks dealing in forex transactions with retail clients are subject to these OCC regulations. 1) The OCC regulations are much more recent, but were designed to align with the CFTC regulations. The two sets of regulations are almost the same. 3) If a forex broker is not a bank, then that broker is regulated by the CFTC and the NFA. That broker must follow both the CFTC regulations and the NFA rules. 5) For more serious violations, both the NFA and the CFTC may take action against a forex broker, with a separate set of judgments and fines made against that broker. 1) Retail Foreign Exchange Dealer (RFED): For brokers who deal primarily with forex trading, the RFED is usually the counterparty to your forex trade. If you buy the EUR/USD, the counterparty is the one who is selling the EUR/USD to you. In forex trading, if you win and make money, the counterparty loses that money. If the counterparty makes money, it is because you lost money. RFED’s want you to lose your money so that they can make money. For retail forex trading, your forex broker is often an RFED. Technically, a counterparty is not a broker, but a dealer. However, “forex broker” is a widely used term used by retail traders that also refers to dealers, so this site will keep with that convention. Just be aware that you are generally trading against your “broker”, which is a conflict of interest. Note that brokers who use straight through processing to offset your trade with other counterparties are not in as direct a conflict. 4) Introducing Broker (IB): An IB solicits business from customers to trade forex, but does not handle any of the money or get involved in executing the transactions. An IB typically drives forex customers to a retail foreign exchange dealer (your broker). The IB is usually paid a share of the money which that dealer makes from the customer. Why do forex regulations matter for my forex trading? Unregulated Commodity Pool Operators: smaller managed funds are not subject to regulatory oversight. Managed funds are one of the key types of scams that we elaborate on in more detail. THe most important thing for you to remember if that if you are going to participate in a managed fund, make sure it is a fund that is registered with the regulators. That way you will benefit from regulatory protection, and have a better means to recover funds in the event that the fund engages in fraud. Unregulated Commodity Trading Advisors: there are a ton of sources on the internet giving detailed forex trading advice. Most of it is bad advice. By giving the advice in a generic fashion, such advice is not subject to regulation. This area is full of scam artists. You should be very mindful of your sources of trading advice. Above all, never give trading authority to a third party unless they are a regulated commodity trading advisor. This will give you better protection in the event of a fraud. The NFA is one of the most effective financial regulators on the planet. They keep a close watch over their members, and they go after them pretty hard in the event of wrongdoing. They require their members to follow additional rules vs what the CFTC and OCC regulations require. As such, you should consider choosing a forex broker is an NFA member, rather than a bank offering brokerage services that are only subject to to the OCC regulations. RFEDs in the US (your forex broker) must make many disclosures to you. They are not allowed to engage in any fraudulent activity or to deceive their customers. They must let you know what you are getting into. The risk disclosure must also inform the customer of the number of retail forex accounts and the percent that are profitable. Additional disclosures are advised if forex trading is not advisable for a potential customer based on financial goals, financial resources or forex trading inexperience. Capital Requirements: Generally, forex dealers are required to carry net capital of $20 million + 5% of liabilities owed to customers. In some cases it may be more than this. Other: there are additional requirements for recordkeeping, reporting, supervision, NFA reporting, membership dues, and anti-money laundering. Simply put, many forex brokers have violated US forex regulations. In many cases, forex brokers have repeatedly violated those regulations. In many cases, the regulatory violations appear have been deliberate, with the intent to break the rules to take more money from their customers. On the other hand, there are several forex brokers who have never been subject to any regulatory action over all the years they have been dealing in forex. This would appear to represent an effort to run an honest business with fair treatment to customers. What kind of forex broker do you want to deal with?